There are a couple of ways to calculate how many lamps you will need, and how far apart they should be. Most of the time, you can do this the easy way, but for applications where you need maximum accuracy, be prepared to break out a sheet of paper and a calculator. It isn't that hard, but it does take some planning and a little homework. First, lets cover the easy way, which will work for most of you who are doing UV curing or wood aging. Those of you that are using the lamps for growing plants should just skip this page, it doesn't apply to you. Most of you aren't doing high level production and just need a solid, easy and reliable way to tell how to place lamps. First is the rule of distance: The closer you get from lamp to item, the stronger the UV. This isn't linear, but exponential, so doubling the distance (say from 4" to 8") won't cut the power by half, it will cut it by 75%. (see the Inverse Square Law for more details, or simply trust me.) The lamps are warm, but shouldn't get too extremely hot. As long as the item you are curing can handle being warm, get the lamps as close as you can. 1 inch is great. 6 inches is acceptable. If you get over that, you can expect much, much slower times. For some items, like guitar curing boxes, you pretty much have to be around 6 inches away to accommodate different sizes of instruments, but you are going to be using a lot of lights from different angles, which will make up for much of this. The next issue is "how far apart should the lamps be?". First, you can't make them too close, but you can make them too far, so adding more lamps is fine. Now, the distance between the lamps should LESS THAN the distance to the item. For instance, if you are going to be 4 inches away from the item, you need to make sure that the air gap between lamps is LESS than 4 inches, or that the distance from center lamp to center lamp is equal to the distance to the item being cured. The lesson here is pretty simple: the farther the distance to the item, the less lamps you can use. Yes, but it also means that going from 8 lamps at 2 inches from the item, to 4 lamps that are 4 inches means the power from each lamp is cut by 75%, AND you have 50% less lamps. In short, it will take 8x longer to cure the item. If you were looking at a 5 minute cure, now you are looking at a 40 minute cure. Two very different animals. Perhaps that is fine for you, but most people want faster cure times, which reduce the chances of something bad happening. 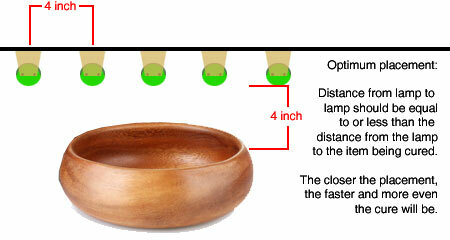 To better understand RUVA lamps, here is a diagram that gives you a pretty good idea how the light spreads. All lamps (RUVA or standard) are hottest directly under the lamp, but the RUVA lamp has a distinctive pattern, pushing the light in a single direction. 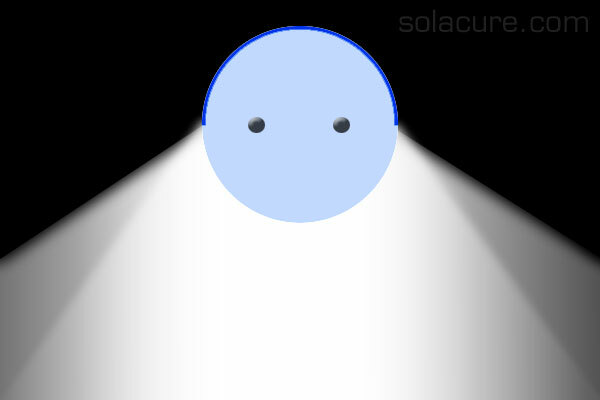 Almost all Solacure lamps are RUVA style. If you are trying to go on the cheap (hobbyists) that is fine, but never go less than 1/2 of the basic guideline above, or you simply won't get the results you need. At half the recommended distance (lamps are 8" apart, item is 4" away), you WILL get cold spots between the lamps, and may find you need to pull back and be patient. On other hand, if you are doing high volume production, you can double up the lamps and get much faster results. If you are 2" away from the lamps, and you have lamps mounted so they are almost touching, you will cut your cure times by 60-90%. For anyone doing a fair amount of curing, this is actually less expensive in the long run and will let you have more control over the cure process. Often, customers will buy more lamps and ballasts because they want faster curing times, but I've never seen someone complain that their items are curing too even or too fast. More lamps is always better than fewer.